The list of council taxpayers unhappy with this council just grows and grows like Topsy! People wanted and needed this sports centre. The LibDems didn't listen and maybe this issue cost the Leader, Call Me Dave, Goddard his council seat. Yay!!!!! As a bereaved mum myself, my heart goes out to this family. 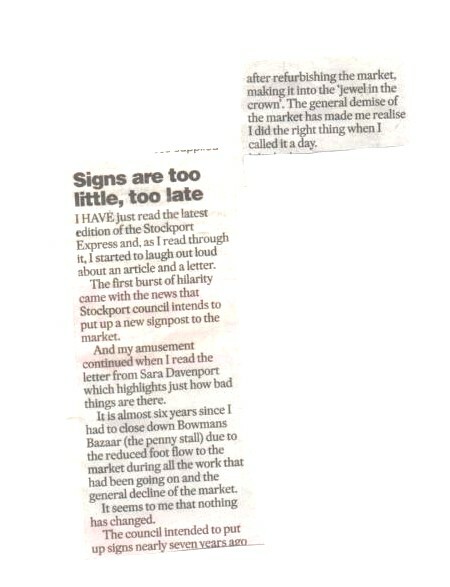 The above letter to the Stockport Express on 1/8/12 shows the problems blue badge drivers are facing. Please see the link opposite. This comment is at the very end of that question. We provide primary school transport for children with ASD,but we are allocated the transport run by S.M.B.C. We have been doing this run for 5 years now and I love my work. However in january 2012, we were forced to accept a 12% reduction in transport costs. This was because S.M.B.C transport wanted to reduce their budget.THIS IS SOMEWHAT UNDERSTANDABLE CONSIDERING THE STATE OF THE ECONOMY.Then, in february 2012 ,the council wanted us to acommodate them once again and reduced our costs yet further.We complied to this on the condition that this meant we would be able us to continue the transport , preventing any disruption to their continuity of care and any distress for the children . In the 5 years I have been with these children I can now understand their speech and can communicate with them daily. We have now been informed by SMBC ,that in September 2012 ,the transport is being allocated elsewhere in order to save more transport costs. SMBC have told the parents and ourselves that the decision is final and cannot be contested ,and that the needs and welfare of these children come second to this .We have shown our committment to these children by cutting our own costs in these hard times. SMBC should show their committment by addressing the situation ,by complying with the requests of the parents who know what is best for their child. THIS IS UTTERLY DISGRACEFUL!!! !.The childrens parents have complained to stockport solutions,the SEN,ANDREW WEBB,and ANDY SIMPKINS,stating that children with ASD do react well to change at all, let alone strangers, but these complaints have come to no avail. Can anyone advise us where we can take this matter further FOR THE SAKE OF THESE LOVELY VUNERABLE CHILDREN.THANK YOU!"